A perfect day on the courts for the Dryden Eagles on Tuesday as all four teams took on the Beaver Brae Broncos in league play. The seniors started the day off with the girls basketball squad toppling the Broncs 47-12. Wilma Oombash and Candace Taylor lead the Eagles with 10 each, and Andy Louttit and Emile Gardam each added 6. In senior volleyball, Beaver Brae wasn’t going home without a fight, but the Eagles fought to a straight sets win 25-15, 25-23 and 25-22. 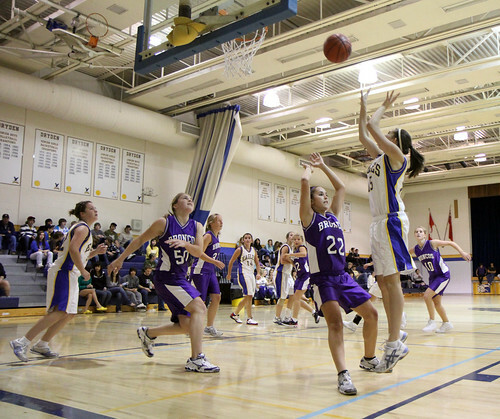 The junior teams closed out the day with girls basketball winning 31-19. Ashley Kropelin led scoring with 6 points and Amy Doudiet added 5. The junior volleyball squad took four games to down the Broncos, 25-19, 13-25, 25-14 and 25-20. Great work teams! Next home action is Thursday when the Eagles take on the Fort Frances Muskies. Come out and cheer on the blue and gold!